container – Life is not Accumulation, it is about Contribution. Life is not Accumulation, it is about Contribution. Sometimes when we are working in container environment, we found server’s version is not the same as client’s version. So we can not connect to the server. To easily solve this issue, we should install dvm (docker version manager) so we can easily move from one environment in our client to another. Following our tutorial, now we will continue to do the installation and configuration for those components. A traditional container environment use the host/server to handle several containers. Docker has the ability to import images into the host, but the resource is tied to that host. The challenge is sometime that host has a very limited set of resources. To expand resource on that host, then we need to shutdown the host and then the containers. Then we need to add resource for that physical/virtual machine before more containers can be powered deployed. Another challenge is the container is not portable as it can not be moved to another host since it is very tight to the OS kernel of the container host. Another concerns other than resources, already explained in my earlier post regarding some enterprise features if we would like to run docker in production environment such as security, manageability, availability, diagnosis and monitoring, high availability, disaster recovery, etc. VIC (vSphere Integrated Containers) can give the solution for all those concerns by using resource pool as the container host and virtual machines as the containers. Plus with new features of vSphere 6 about Instant Clone now VIC can deliver “instant on” container experience alongside the security, portability, and isolation of Virtual Machine. Adding extra hosts in the resource pool to dynamically increase infra resources, initiate live migration/vMotion, auto placement/Distributed Resource Scheduler, dedicated placement/affinity, self healing/High Availability, QoS/weight, quota/limit, guarantee/reservation, etc will add a lot of benefits to the docker environment. So, these are our steps to prepare the environments for vSphere Integrated Containers (VIC). So, let’s start the tutorial now. I am running my virtualisation infrastructure in my Mac laptop using VMware Fusion Professional 8.5.1. Currently I am using vSphere ESXi Enterprise Plus version 6 update 2, and vCenter Standard version 6 update 2. I have NFS storage as my centralised storage, NTP, DNS and DHCP also configured in another VM. Download that binary to the Virtual Machine that you will be used for VIC Management Host. Extract the file using = $ tar -zxvf vic_6511.tar.gz. NOTE:You will see the latest build as shown here. The build number “6511” will be different as this is an active project and new builds are uploaded constantly. Okay, after this we will Deploy our Virtual Container Host in VMware environments (I am using vCenter with ESXi as explained earlier). The installation can run on dedicated ESXi host too (without vCenter) if needed. Now, continue to create the Virtual Container Host in the vCenter. Since I am using Mac, I will use command prompt for mac. After that command above, let’s check the condition of our virtual infrastructure from vCenter now. Currently we will see that we have a new resource pool as the virtual container host, and a vm as an endpoint vm as a target of the container host. Okay, installation is completed. Let’s try to deploy a docker machine into the VIC now. After that, let’s do the pull and run command for the docker as normal operation same as my previous posts. Note: for production, we must use the *.pem key to connect to the environment. Since this is my development environment, so I will skip that. In this tutorial, after explaining about running Docker in my Mac. Now, it’s time to move those dockers on your laptop to production environment. In VMware, we will utilise vSphere ESXi as the production grade virtualisation technology as the foundation of the infrastructure. In production environment, lot of things need to be considered. From availability, manageability, performance, reliability, scalability, security (AMPRSS). This AMPRSS considerations can be easily achieved by implementing docker container from your development environment (laptop) to the production environment (vSphere ESXi). One of the concern of docker technology is the containers share the same kernel and are therefore less isolated than real VMs. A bug in the kernel affects every container. vSphere Integrated Containers Engine will allow developers familiar with Docker to develop in containers and deploy them alongside traditional VM-based workloads on vSphere clusters, and allowing for these workloads to be managed through the vSphere UI in a way familiar to existing vSphere admins. Docker itself is far less capable than actual hypervisor. It doesn’t come with HA, live migration, hardware virtualization security, etc. VIC (VMware Integrated Containers) brings the container paradigm directly to the hypervisor, allowing you to deploy containers as first-class citizens. The net result is that containers inherit all of the benefits of VMs, because they are VMs. The Docker image, once instantiated, becomes a VM inside vSphere. This solves security as well as operational concerns at the same time. But these are NOT traditional VMs that require for example 2TB and take 2 minutes to boot. These are usually as big as the Docker image itself and take a few seconds to instantiate. They boot from a minimal ISO which contains a stripped-out Linux kernel (based on Photon OS), and the container images and volumes are attached as disks. The ContainerVMs are provisioned into a “Virtual Container Host” which is just like a Swarm cluster, but implemented as logical distributed capacity in a vSphere Resource Pool. You don’t need to add or remove physical nodes to increase or decrease the VCH capacity, you simply re-configure its resource limits and let vSphere clustering and DRS (Distributed Resource Scheduler) handle the details. The biggest benefit of VIC is that it helps to draw a clear line between the infrastructure provider (IT admin) and the consumer (developer/ops). The consumer wins because they don’t have deal with managing container hosts, patching, configuring, etc. The provider wins because they can leverage the operational model they are already using today (including NSX and VSAN). Developers will continue to develop dockers and IT admin will keep managing VMs. The best of both worlds. It also can be combined with other enterprise tool to manage the Enterprise environment, such as vRealize Operations, vRealize Log Insight, Virtual SAN, VMware NSX, vRealize Automations. vSphere ESXi 6 U2 as the number one, well-known and stable production grade Virtualisation Technology. vCenter 6 U2 as the Virtualisation central management and operation tool. 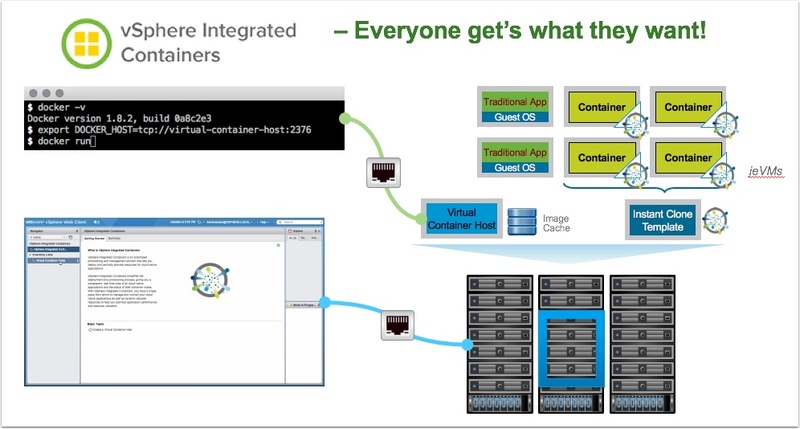 As you can see in the diagram above vSphere Integrated Containers is comprised of three main components, all of which are available as open source on github. With these three capabilities, vSphere Integrated Containers will enable VMware customers to deliver a production-ready container solution to their developers and app teams. *to be continued in part 2. As previous post, I will elaborate about Cloud Native Applications. But before that, I will post some basic concepts about Docker as the Container technology for Cloud Native Applications approach. Docker is an open platform for developing, shipping, and running applications. Docker enables you to separate your applications from your infrastructure so you can deliver software quickly. With Docker, you can manage your infrastructure in the same ways you manage your applications. By taking advantage of Docker’s methodologies for shipping, testing, and deploying code quickly, you can significantly reduce the delay between writing code and running it in production. In this post, I will start with the basic on how to run your first application in Docker that will be provisioned in your Mac laptop. Then, I will do that also in vSphere Integrated Container and also VMware Photon Platform. Actually there are two approach to run docker on your Mac. The 1st one is to utilise Docker for Mac (which we will do this), and the second one is to utilise Docker Toolbox. The difference is in Docker for Mac approach, we will utilise HyperKit as lightweight virtualisation technology to run the container. Docker Toolbox will utilise Virtualbox as the virtualisation technology. Actually you can run both Docker for Mac and Docker Toolbox approach at the same time in your MacOS, but there are several things that you need to do, such as create different environment (set and unset command). I will not elaborate that in this post. Assume that your machine is empty for Docker engine. Install and Run Docker. Double click Docker.img that you have downloaded earlier to start the installation. Check Docker version that is now running on your Mac after the installation is completed. Let’s start with your basic application. Let’s do nginx web server using docker. Check your http://localhost first to check the status. Basically, docker will try to run the source of your application locally. But if docker can not find it, then it will search through the public repository (default configuration is docker hub). Check your http://localhost now to check the status. If you want to stop and remove the container, use the command docker rm -f webserver. If you want to delete the local images do the command docker rmi nginx. But before that, you can list the local images using docker images. If you want to use another docker repository other than https://hub.docker.com or do a file sharing from your Mac to your docker engine, you can also configure that in the Docker for Mac menu. For this example we will utilise Docker Compose to run WordPress in an isolated environment. Compose is a docker tool for running multi containers environment. We will create a compose file, and then execute the YAML file using docker-compose command. Create a directory for the project in your Mac. Create a docker compose file. This will include wordpress and mysql to create a simple blog website. Check whether the images already installed and run. Using docker images and docker ps command. Do the installations of wordpress using the UI wizard, then finally open the created site. Cloud Native Applications implementation using container technology is hardly to ignore if you want to keep up with this culture of agile and fast innovations. VMware have two approaches to support for this initiative. Either to use vSphere Integrated Container approach or VMware Photon Platform approach. If you want to run both containerized and traditional workloads in production side by side on your existing infrastructure, VIC is the ideal choice. VIC extends all the enterprise capabilities of vSphere without requiring additional investment in retooling or re-architecting your existing infrastructure. If you are looking at building an on-prem, green field infrastructure stack for only running containerized workloads, and also would like a highly available and scalable control plane, an API-driven, automated DevOps environment, plus multi-tenancy for creation and isolation resources, Photon Platform is the way to go. In this couple of weeks, I will elaborate more about this cloud native applications. Please wait for my next posts. We will utilise: Mac OS, Docker, Swarm. We will utilise: VMware vSphere, vCenter, Photon OS, Harbor, Admiral. These are top 16 Common/Killer Use Cases from VMware NSX for You! Tutorial Instalasi Server DNS, NTP, NFS, iSCSI, VMware vSphere 6.5 (ESXi dan vCenter) di VMware Fusion for Mac atau VMware Workstation for Windows/Linux untuk Virtualization Home Lab. What is Hadoop? Why do we need to virtualize it using VMware? MICROSERVICES – What is Cloud Native Application? Consideration to Deploy Edge Cluster in vCloud Director. Also discussing about VSAN Architecture. Berapa Lama untuk melakukan migrasi dari server Physical to Virtual (P2V)? vRealize Automation 7.0 List of Improvements and it is GA now! Find Something in this Blog!